Twitter announced it's rolling out a new feature that should give the often-cryptic or vague nature of popular tweets a little more context, thanks to the addition of "related headlines." In an official blog post, the social network explained how when Tweets are embedded to augment stories on other news sites, that site's story will appear within the tweet's permalink. The tweet's permalink page will display a list of links to all articles where that particular tweet has been embedded, with the idea being to give users easy access to the full story from their preferred news source. The example Twitter uses to explain the feature is the story of Jason Collins, who become the first openly gay NBA player earlier this year. After the story broke, Collins tweeted thanks for the support he'd received, which was retweeted thousands of times. However, those unaware of the news wouldn't have known what he was actually thanking them for! Twitter Software Engineer Brian Wallerstein explained: "This year when NBA center Jason Collins became the first NBA player to publicly come out, the news traveled quickly on Twitter. 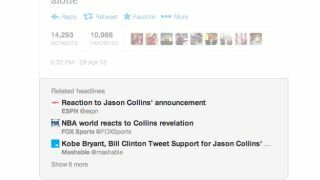 As outlets like ESPN, MSNBC and sports blog Bleacher Report reported the story, they embedded @jasoncollins34's tweet and then provided additional context that wasn't available directly on Twitter." Twitter said publishers should see more a traffic for stories appearing in this section and should boost the number of news outlets that are embedding tweets, if for no other reason than to get the potential kickback. However, the company has still been quite vague in explaining how this will all work and what is necessary for a tweet to qualify for these related headlines. It is rolling out the service to publishing partners at present, but hasn't confirmed what'll happen for other news outlets or the larger public going forward. Mark Zuckerberg may have founded the world's most ridiculously popular social network, but not even he can keep is wall hack-free.